It's one of those things you've probably never even bothered to think about, so think about it now: just why is a mouse cursor a slanted arrow and not, say, a straight arrow? Or a pointing fish? Or something? The answer is a simple one. Go back in time to the birth of the mouse and we find we're dealing with displays with a very low pixel count. 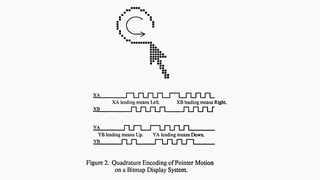 Douglas Englebart's very first designs for a mouse cursor had it pointing straight up, which on those blocky monitors made the pointer tough to spot. So the R&D team at Xerox had an idea: slant the mouse. The angular side would make the pointer stand out in a screen made up of mostly straight lines (and letters). Steve Jobs and Bill Gates borrowed the idea, and despite the displays of today (or even the 90s) advancing well beyond the need for a slanted cursor, the tradition has stuck.